These salmon appetizers are almost as gorgeous on the plate as they are delicious - and they're so easy you'll have all your party guests fooled. 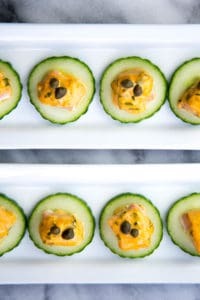 These Dynamite Salmon Appetizers might be my favorite appetizer ever – gorgeous, easy to prep, served room temperature and delish! What else can you ask for? This Dynamite Salmon appetizers recipe is inspired by one of my favorite dishes at a local sushi restaurant. The chef there makes the recipe with crab stick (did you know fake crab has gluten!?!) and regular soy sauce (no again!) so I can’t order that anymore – but my sauce is just as good. How, you ask? Well, my mom sat at the counter and ordered it several times and watched the chefs mix up the sauce, wrote the recipe down and gave it to me, that’s how. We don’t call her Saint Joanie for nothing, folks. I refined the recipe and created this appetizer, which is delicious. You don’t have to take my word though; Love With Food, GFF Magazine and YUM Gluten-Free Australia have all featured it. 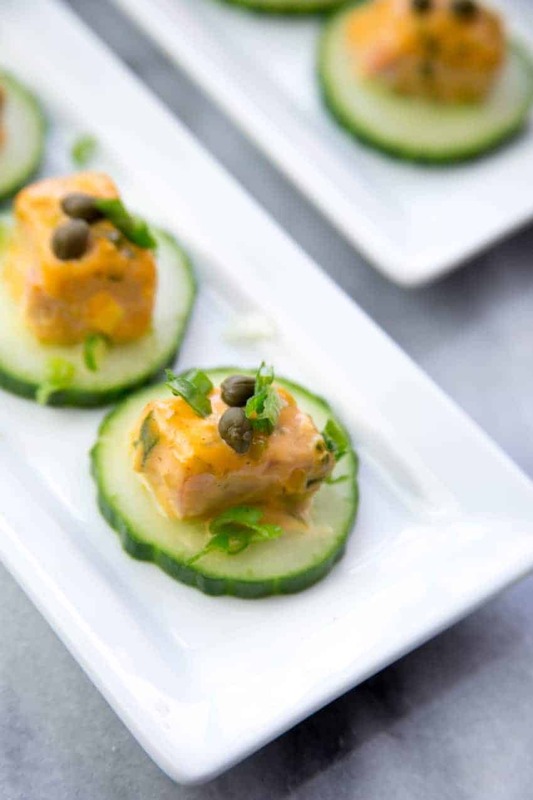 This salmon appetizers recipe has a slight kick that’s totally addictive, which you’ll notice when guests immediately go back for seconds (and thirds!) You may want to make a double (or triple!) batch. The sauce will definitely work for full pieces of salmon or other fish too – so let those dynamite-fueled creative juices flow. Make it easy, make it ahead: you can cut the salmon into cubes the day before and just pop them in the fridge overnight, and sauce can be mixed up the night before too. The cucumbers can also be cut into rounds and stored in the fridge in a sealed container. Then all you have to do is cook the salmon and assemble. Look for these ingredients in the Asian section of your grocery store if you don’t have them handy, or follow the links to Amazon: wasabi powder, Tamari soy sauce, and sriracha. Mix all of the sauce ingredients together in a medium sized bowl. Line a rimmed baking sheet with parchment paper or a Silpat, and place the cubes of salmon on the sheet about 1 inch apart. Top each salmon cube with a large dollop of the sauce. Bake at 400 degrees for 4 minutes. Remove from the oven and allow to cool on the baking sheet for at least 5 minutes. Spread the cucumber rounds out on a large dish or serving tray. 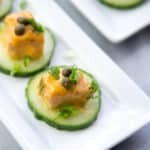 Using a small spatula or fish spatula, transfer one salmon cube to each cucumber round. Top each salmon cube with two capers, and serve. This entry was posted in Appetizers & Snacks, Dairy Free, Fabulous Fish Dishes, Paleo Friendly, Recipes and tagged appetizer, dairy free, g-free, g-free diet, G-Free Foodie, gfdf, gluten free cooking, gluten free food, gluten free holiday, gluten free snacks kc cornwell, paleo friendly. Bookmark the permalink.